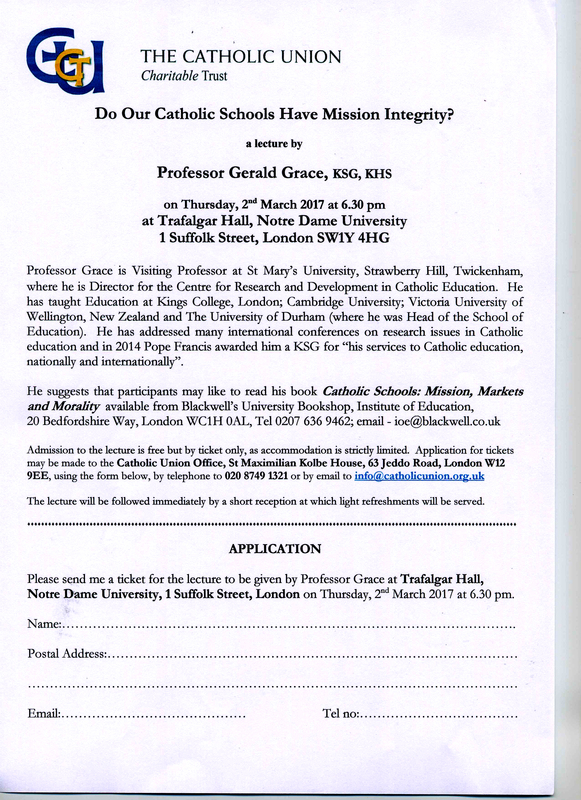 On Thursday 25th February, Francis Campbell BA, MA, gave a talk to the members of the Catholic Union at the University of Notre Dame, Suffolk Street. The topic of Catholicism in the Secular World proved to be an insightful look into how Catholicism is evolving in the UK and the world based on current events. There were many sub-topics that were covered with Mr Campbell using the concept of Faith Schools and their importance to British culture to battle the concern of radicalisation. This comes at a very opportune time with Louise Casey’s reports on cultural differences that are being used to show the positives and negatives of secularism. It was certainly a talk that the members found thought provoking as Mr Campbell delved back centuries to other cultural divides such as the various Enlightenments to show how reason and faith have always been linked. This was accompanied by quotes from academics and Pope Francis himself to show how identity and individuality, religious or not is vitally important to create a functioning society. 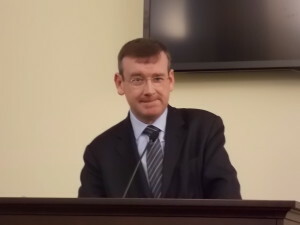 The Catholic Union would like to thank Francis Campbell for taking the time out to give this informative presentation and answer questions on a subject that is a concern not just for Catholics but the United Kingdom as a whole. This entry was posted in Events Past, News on March 1, 2016 by John Barrie. The Catholic Young Writer Award includes a £50 cash prize, book prizes, and a shield to be kept for one year. The Award is open to all Roman Catholic students of secondary school age in England and Wales, and all pupils at Roman Catholic secondary schools in England and Wales. Choose one of the following saints, tell us about his or her life and work, and importance in the story of the Christian faith in Britain. List every internet site that you access, and add a Bibliography of books, pamphlets or other material that you have consulted. Your essay should be no more than 2,000 words in length. It can be handwritten or produced on a computer. You can illustrate it if you wish. There should be no material that is simply “cut and pasted” from the internet. We accept individual entries, but the project is really aimed at whole classes of groups of students. Entries should be collected together and sent as a group. This entry was posted in News on January 25, 2016 by John Barrie. 2015 Catholic Young Writer Award: pupils study CS Lewis on the subject of Christ’s divinity. The winner of the 2015 Catholic Young Writer Award, sponsored by the Catholic Union Charitable Trust is Joseph Ruane of Ampleforth College. Second prizewinners are, jointly, Cicely Willis of St Mary’s School, Shaftesbury, and James Sykes of St Edward’s School Cheltenham. Entrants were invited to analyse and discuss a passage from CS Lewis’ Mere Christianity in which he examines Christ’s claims to divinity. Joseph Ruane is a VI former at Ampleforth and is a past pupil of Cardinal Heenan High School, Leeds. His essay exploring the divinity of Christ showed maturity and understanding, and evidence of having studied the Scriptures and the Catechism of the Catholic Church. He wins a £100 cash prize, a collection of books – including Lewis’ Mere Christianity – and a trophy to be kept for one year. By tradition, the trophy – an engraved shield bearing the names of the various annual winners – is passed on personally from winner to winner each year. Joseph’s trophy will thus be sent to him by Leo Stoy, of St George’s VA College, Southampton, the 2014 Catholic Young Writer. The Award was initiated some years ago by The Keys, the Catholic Writers’ Guild of England and Wales, and following its growth in scope and popularity is now organised through the Catholic Union of Great Britain. This entry was posted in News on November 5, 2015 by John Barrie.